What a glorious day, for a lovely couple from Texas! I couldn't wait for Fevi to send me these pictures because I knew how special they were. This couple were visiting on a cruise ship, and we took them to our "new" beach, a lovely private spot off Mary Molly Road in West Bay. It was hot! But the colours of the sand and sea were fabulous against G's formal wedding dress. This is the "tropical" bouquet I often recommend to my brides. It is such fun to work with a couple who are game to try exciting and unusual shots. As you can see, G was not averse to playing in the surf. A toast to the newly -weds, and then off back to the harbour to rejoin their cruise-ship. Cayman is one of the few ports on the northern Caribbean cruise itinerary where you can be married the same day. 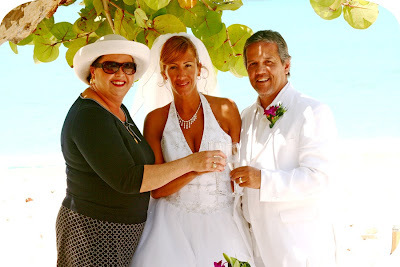 Getting married in Cayman is very easy, when you have a wedding planner and Marriage Officer who will work with you to make sure everything goes smoothly. Today there was not a wedding jitter in sight, it was a lovely fun day for all of us.